The ability of bed bugs to return so quickly after human attempts to get rid of them has been explained by University of Sheffield researchers. Genetic analysis has shown that a single pregnant bed bug that escapes detection can be responsible for an entire infestation, rapidly producing generations of offspring. It could create a colony of thousands of bed bugs, feeding on a single human. The study was based on London, which has seen a resurgence in bed bugs. A DNA study showed that colonies of bed bugs in a house or hotel could all come from a common ancestor or a handful of female bed bugs. The rapid expansion in numbers could take place over a matter of weeks - at which point there is usually human intervention to destroy the bugs. Bed bugs, which live on human blood, cannot fly and depend on their human carriers for travelling any distance. There has been a rise in bed bug numbers and researchers wanted to know how they could suddenly appear in such large numbers after apparently being removed. 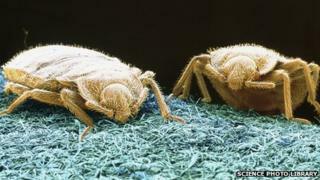 Researchers say bed bugs' ability to generate a new colony from such small numbers might be a "clue to their recent success". If a single pregnant bed bug manages to hide away, getting into a traveller's luggage for example, it is enough to begin a new infestation. Adult bed bugs can grow to about 5mm in length. Prof Roger Butlin said bed bugs had almost disappeared from London by the middle of the 20th Century, but their numbers had risen since the 1980s. Among the theories about the increase has been that they have followed transport routes and international travellers. They are also believed to have grown more resistant to chemicals used to get rid of them. "The number of bed bugs in cities has risen dramatically, but there's no solid information why that is," said Prof Butlin, from Sheffield University's department of animal and plant sciences. He added bed bugs could survive without feeding for a month, waiting for a human to arrive. A property could have tens of thousands of bugs, he said, all trying to live on the human residents. "If you just miss one, they can grow very quickly," he added.